My race that was supposed to happen last Saturday was rescheduled for this Saturday the 28th, due to snow and ice. I’m thankful for that because I was not in the least prepared for it. Having said that I went on my first training run last night since well before the holidays and ran 3.22 miles in 33 minutes. I would have kept going because I felt great (and this was after morning stroller fitness) but Sky was not loving being in the stroller for a second time in one day. She literally screamed the entire time, so I cut it short. I think February will bring an end to a race a month. I just can’t afford to register for a race I’m not excited to do/really want to do. There are a couple of races I could do, but I don’t really want to do them. I would rather save money and wait until there is a race I really want to do than spend money on a race just to make sure I get in a race a month. Plus, my 1/2 training starts next month and I’m totally fine with focusing on putting all my energy into the training plan and making each mile count, figuring out how to fuel on a longer run/getting used to my new fuel belt etc. Besides there is always the virtual SB run we did last year, and the potential for another virtual run in Feb…so I may still have options. My goal this week is to put my all into the sprints the rest of the week in Stroller Fitness, I’m just not feeling like running in the rain and treadmills make me motion sick. I also plan on printing the 1/2 marathon training schedule I’m going to follow and sitting down with my calender to figure out how I’m going to fit it in. Training for that starts the week after the SB. 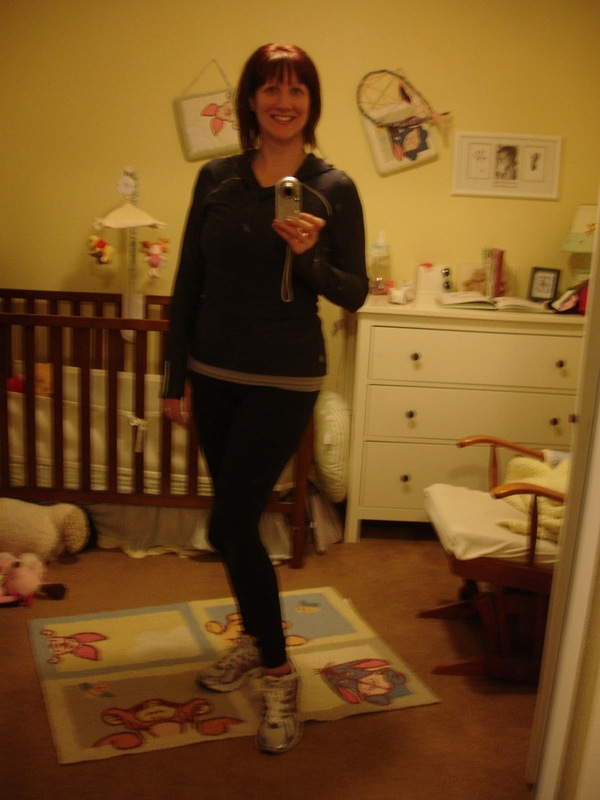 These pics are for you Dad…thank you for the running outfit! 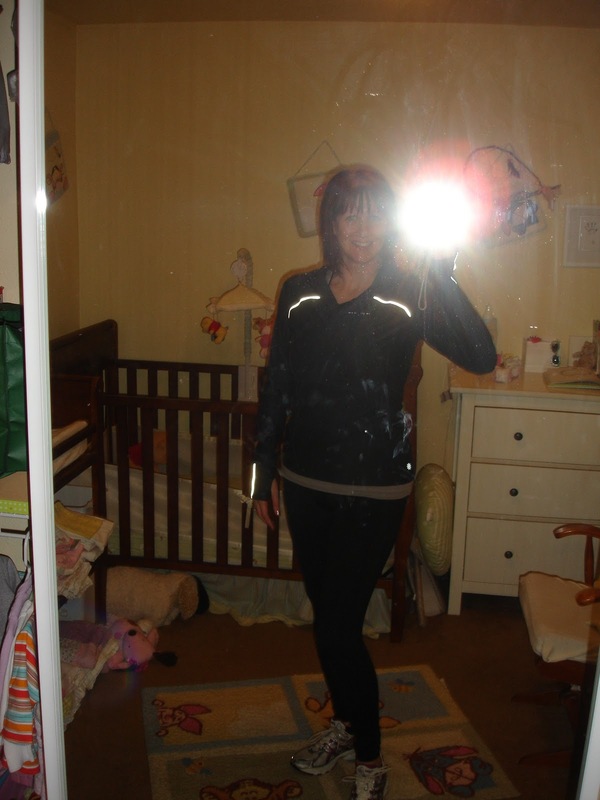 This is a supper cute hooded Athleta top and Athleta compression running leggings. (I have to use the nursery because Sky has full length mirrored closet doors.) I took a flash pic to show off the strips of reflective material on the top. I also have a flashing yellow light that clips onto the stroller or fuel belt, or whatever I can clip it onto, for running in the dark. Same pic without flash. These leggings are by far my favorite running “pants” every! They fit perfect, look great on, and provide the perfect amount of compression. My legs felt like they could go and go and go, and that was after having done a morning workout. < Previous We Have An 8 Month Old!